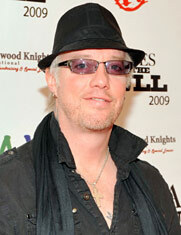 Jani Lane, who fronted the glossy rock band Warrant during the salad days of hair metal, was found dead in a motel room in Woodland Hills, Calif. Thursday evening of undetermined causes, police have confirmed. He was 47. Details are scarce, but Lane was reportedly discovered at a Comfort Inn near Los Angeles. The death was first reported by TMZ. Known for his golden boy looks and a voice that hearkened back to the 1970s era of arena rock wailers, Lane penned many of Warrant's huge hits, including "Down Boys," "Uncle Tom's Cabin" and the band's biggest charter, the 1989 ballad "Heaven." He also preened and grinned in the band's most memorable contribution to popular culture, the brazenly sexist video for the 1990 camp hit, "Cherry Pie." He left Warrant in 2004 and a year later a bloated Lane surfaced to clean up his act during the 2005 season of VH1's "Celebrity Fit Club." A healthier Lane rejoined the group in 2008 only to leave it again months later, this time for good, over business matters. Lane was arrested twice in recent years on DUI charges and he ended up serving time in jail. In recent years he has worked on a solo career and has acted as a hired gun as recently as 2010 for "Once Bitten Twice Shy" band Great White. Lane was born John Kennedy Oswald in Akron, Ohio on Feb. 1 1964 -- the name a nod to the president who had been assassinated the year before. His parents soon changed his middle name to Patrick. Throughout his youth he played the drums but his good looks and huge voice pushed him to the microphone. He adopted his stage name around 1983 and a couple years later moved to Los Angeles searching for fame -- which he found after teaming up with core members of Warrant. From 1989 to 2001 Lane appeared and was the primary songwriter for six studio albums. Two of them -- 1989's "Dirty Rotten Filthy Stinking Rich" and 1990's "Cherry Pie" -- went on to go double platinum. Like so many other hair metal bands, though, Warrant couldn't overcome the grunge juggernaut and they were never able to replicate their early chart success. Lane was married three times, first to model Bobbie Brown, who was featured in the "Cherry Pie" video. According to his website and Twitter profile, Lane's third wife is named Kimberly and he leaves behind four children, Taylar, Brittany, Madison and Ryan.